Available in other colors (White Shown). Equipped with a high performance, professional level motor, the Professional™ 600 Series mixer can effectively mix up to 14 cups of all purpose flour per batch. This mixer powerfully churns through yeast bread dough and triple batches of cookie dough. Offered in a Variety of Colors Including Pearl Metallic and Nickel Pearl, Which Compliement KitchenAid's Pro Line® Series of Appliances. Click here, if you want to learn more about KitchenAid Mixers. This grinder attachment greatly expands what a stand mixer can be used for. Perfect for grinding meats, grating cheese, making bread crumbs and combining dips, salsas, spreads. Two different grinding plates are included, one course, one fine. Accessory also includes tips, and recipes. For easy cleanup between uses, most parts dishwasher safe. This grinder can be used with any KitchenAid stand mixer. 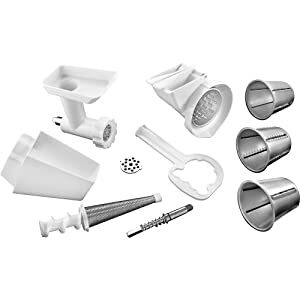 Can be used with the KitchenAid Professional and/or stand mixers. Includes food grinder, slicer/shredder, and fruit/vegetable strainer. Grinder has fine and coarse grinding blades. Most (but not all) parts are dishwasher-safe. The Professional 600™ has a powerful motor that is crafted for commercial-style performance, the direct drive, all-steel gear transmission delivers unyielding power for professional results. 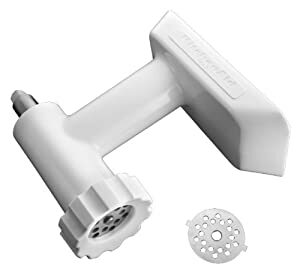 The mixer can effectively mix up to 14 cups of all-purpose flour per recipe and produce up to 8 pounds of mashed potatoes. The Soft Start mixing feature helps minimize ingredient splatter and flour puff with gentle acceleration to selected speed after start-up. Electronic Speed Sensor monitors operation to maintain precise mixer speed. Commercial-style motor protection automatically shuts off the mixer when overload is sensed to protect the motor. Durable all-steel gears provide reliable service. 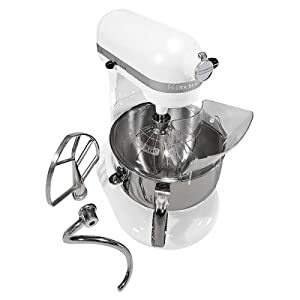 The mixer includes a 6-quart-capacity stainless-steel mixing bowl with a contoured handle, as well as a professional wire whip, a burnished flat beater, a spiral dough hook, and a one piece pouring shield. Its multipurpose attachment hub with a hinged hub cover flips open to allow for easy installation of attachments. The Professional 600™ Series bowl-lift design raises the bowl into the mixing position, and its solid, truly seamless one-piece motor head design is easy to clean and comes in a variety of fashionable colors. This site is one of several kitchen appliance affiliate sites by Wayne McDonald at Imagine Something Worthy, LLC. Each is intended to provide information to assist your purchase through a trusted affiliate seller, such as Amazon. This site is an affiliate site, one of many by Imagine Something Worthy, LLC. If you click thru to the sellers site and purchase this product and/or another, the owner of this site will earn a commission.